Forty years ago, everyone played golf by feel. Today, virtually no golfer hits a shot without first inquiring about the yardage he faces. It's a sad development in that it has slowed the pace of play among both pros and amateurs. But as long as it's become de rigueur you should make the most of it. Take an hour or so to learn the exact distances you hit each club in your bag. Your first 'step' in this process is to determine the precise length of your pace, so that when you step off distances you'll have an accurate gauge of the yardage. Take 10 steps and then get a tape measure to determine the distance. If it's 10 metres, you're lucky - one pace equals one metre - but if the distance Is under or over, you should lengthen or shorten your pace to approximate a metre. Hit a dozen or so shots with each club in your bag, beginning with the wedge. Pace off the shots for each club, and disregard the severe mishits. Average the distance of all others. If the place where you're hitting these balls has extremely hard turf, subtract the metres that the balls bounced and rolled, because the number you want for each club is your carrying distance, not your total yardage. 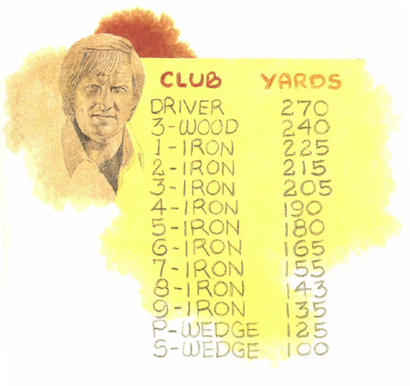 Once you've recorded all your distances, memorize them, or tape the yardage numbers to the shafts of the clubs. Knowing your exact numbers will take a lot of the doubt out of your approach game, and that will translate into smooth, confident swings.